Ten years on from the largest and most iconic corporate failure in modern day USA, it has become quite fashionable to wander back through memory lane or publish Harry Hindsight flashbacks about how it all went wrong; whether there are any lessons from the sorry tale for investors today? Not wanting to spoil anyone’s party, but in the context of the Grand Bear market of that time, and it certainly was a Very Grand Global Bear Market, the demise of Lehman Brothers was by no means the most important event, and it happened quite late on the timeline as well. Today, books have been written and the event features in a number of Hollywood movies and documentaries, while the question “Where were you when Lehman went bankrupt?” sits right up there with 9/11, the fall of the Berlin Wall and the death of Elvis Presley. (I am too young to refer to John F Kennedy’s assassination or the first man on the moon). I know exactly what I was doing when Lehman went under on September 15, 2008. Only a few weeks prior I had made the bold prediction that commodities and related share prices were heading for what could possibly be the most savage sell-off for as long as anyone could remember. I was convinced and ultra-nervous at the same time. Truth is, the Bear Market of 2008, which includes the collapse of Lehman and freezing of the global financial system, made FNArena into what this business is today. Prior to 2008, we were one of many financial media services in Australia. Our unique selling point was that we reported on the most valuable information from each day’s stockbroker research via the Australian Broker Call Report and I would write up various observations and insights from running daily through hundreds of pages of research. But then Bear Stearns went down because of two hedge funds with exposure to collaterised debt obligations and the world took notice. What the hell are these whatever-they-are-called? When the world started anxiously looking around for answers, FNArena became its centre of attention. It’s almost surreal to recall today, but in those days we would receive requests for more information even from staffers inside the investment banks on Wall Street, the centre of this newly emerging problem. Stories were predominantly written by colleague Greg Peel as he and I quickly made a deal: I took responsibility for everything involving content and FNArena, and Greg would 100% dedicate himself to reading, researching, analysing and writing about this new problem very few knew anything about. Result number one was that FNArena immediately stood diametrically opposite the ruling opinion of the day: it’s nothing but a small problem in a very large market, and it won’t affect Australia. Australian banks are safe. Don’t sell. Instead FNArena said: this is a cancer inside the global system and it is going to spread. Australian banks are not safe because the global financial system has now become the core of the problem. Sell your banks. Do it now. Harry Hindsight tells us today bank share prices would not stop falling until they had lost more than -50% over the following 15 months or so, and we kept our negative view all the way through, but as we can all imagine that was a truly horrible time for investors as most had become married to their all-time favourite stocks, and many kept hoping for a long time that FNArena might be proven wrong. It is for this reason that I have been reluctant since to reflect back in public on what was essentially a company-defining two-year period. FNArena was making its mark, and what an Olympic gold medal-effort it turned out to be, but at the same time, so much pain, regret and disappointment came through via emails and otherwise. Many were approaching or already in retirement. We can but hope none of us has to go through a similar experience, ever again. There still is a strong personal connection with that time because I realised I might not have a business for much longer. The core activity at FNArena was to report what the experts were saying, but as share prices kept falling, analysts and strategists turned into frozen bunnies staring into a bright light; nothing useful was said or published. Everyone was waiting for Godot. I realised I had to step up. Then misfortune happened. I fell off a balcony, from two stories down, landing on my head. I didn’t spend much time in hospital, but my brain was in shock. At first, I barely managed to stay awake for an hour, then I had to sleep for a while, until I had enough energy for another hour, then sleep again. I used every minute available to read, research and write. Small miracles can and do happen. All the while, share prices kept falling and companies going bankrupt. Margin calls were called. We found out CEOs had borrowed against their shares and options. Next we focused on the short sellers, in particular those doing it “naked”. And still, no sign of Lehman Brothers going bankrupt at this stage. Just a general sense of bewilderment; nobody was really sure how deep, how long, or how much? Everything ground to a stand still. Quite literally. The Australian Financial Review was publishing poems written by fund managers who had absolutely nothing else to do. One anecdote probably describes the situation best: one day the entire telephone system at one brokerage in Australia had failed and nobody in the office had noticed until late on the day. Stockbrokers had become used to the fact that no phone calls were incoming, and that was now “normal”, and nobody felt the need to even try to call out to attract some business. And share prices, they kept falling. Every pause, or even short-term rally, was subsequently met by renewed selling. The true definition of a Bear Market. Equally largely forgotten today: the malfunctions inside global financials arose in the midst of a gigantic commodities boom; this still was the era of Stronger-for-Longer, the Super-Cycle. Copper miners and the like remained relatively unscathed at first, while crude oil futures kept speeding to the next level up. It truly was the best of times combined with the worst of times. There was tightness in energy markets, but the price of a barrel was doubling in a little over six months. How could economies cope? The answer is, of course, they could never. Historically, whenever a barrel of crude had doubled in price in such a short time, there always had been an economic recession next. No exception. Somehow in 2008 nobody made the connection. Crude oil peaked at US$147/bbl on July 11. Woodside shares peaked one month prior at $70. I was consultant for a European hedge fund at the time. My most valuable contribution was discouraging them going long energy. Just like everywhere else, their investment committee was bulked up with raging oil bulls. What followed next was yet another savage chapter. More money flushing down the gutter. More pain, no gain. By December WTI futures had sunk to US$30/bbl. Can you believe it, this story still has not run its full course? By August, I genuinely and truly admire my own brazenness, I became convinced the next shoe to drop was China and thus commodities and commodities stocks. The world had hung on to the last thing that had still worked up until that point, somewhat, on relative measure, but now carnage was coming, and I was convinced there would be no place to hide. Imagine writing that as the opening sentence of your next communication with investors, who already are low on confidence, high on losses and desperation. My warning got picked up by the Australian newspaper. I remember the journalist during the interview, incredulous, shocked: you mean not one single stock? 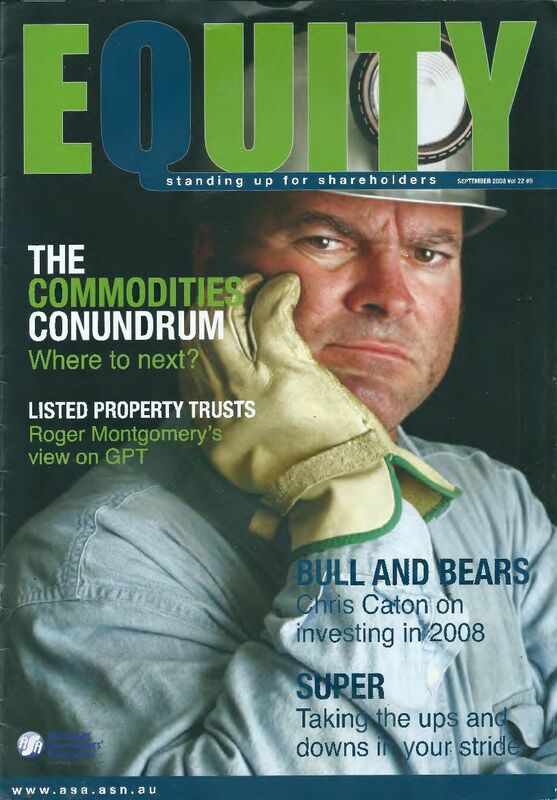 Equity, the magazine of the Australian Shareholders Association, printed my story opposite Robert Gottliebsen who sensed “a looming long-term investment opportunity”. As it turned out, the commodities sell-down in late 2008 was yet to be followed up by two months of more savage selling as the calendar opened 2009. The Australian share market bottomed on the first Friday in March (6), before Wall Street did. For the remainder of 2009 investors would send me gifts, cross the street to shake my hand or they gave me a big hug, saying thanks for everything. But there were plenty of other stories. Subscribers who had no money left. Who said: Rudi, I didn’t read your stories. Or: I was listening to other people. How did I know? Or: I didn’t want to pay capital gains tax. While we made a large number of friends, we also lost many. One such sent us a thank you note while enjoying life on a beach in Hawaii, early in 2008: thanks for the warning, guys. Am all cashed up. Won’t be needing a subscription. All the best! I feel sorry for those who lost out, but am immensely proud, and deeply grateful, having grabbed the opportunity to excel during the darkest of times, and having been rewarded with a group of subscribers who have remained with us since, and who are still actively supporting FNArena in all its endeavours today. It goes without saying, we don’t get everything right all the time. On my observation, we are the only one around who have analysed and dissected the Lost Decade for Australian equities. I appeared in alien costume at the ASX Investment Hour to highlight the importance of dividends long before this became a popular theme. Investors who paid attention would not have stuck with the banks post 2015, and have avoided resources between late 2011-early 2016. My research into All-Weather Performers has guided many to stocks they would never have considered. Quite amazing nearly one whole decade has passed. Thanks to all of you who made this adventure possible, who traveled with us, and are still traveling shoulder-to-shoulder next to us. Even if you joined more recently, I am still truly grateful for what we have achieved together. The FNArena website states: Our quest is not to be bullish or bearish, but to correctly assess future trends. That’s not just a slogan, that’s our raison d’etre. Up to the next chapter! P.S. I – All paying members at FNArena are being reminded they can set an email alert for my Rudi’s View stories. Go to My Alerts (top bar of the website) and tick the box in front of ‘Rudi’s View’. You will receive an email alert every time a new Rudi’s View story has been published on the website. P.S. II – If you are reading this story through a third party distribution channel and you cannot see charts included, we apologise, but technical limitations are to blame. Find out why FNArena subscribers like the service so much: “Your Feedback (Thank You)” – Warning this story contains unashamedly positive feedback on the service provided.